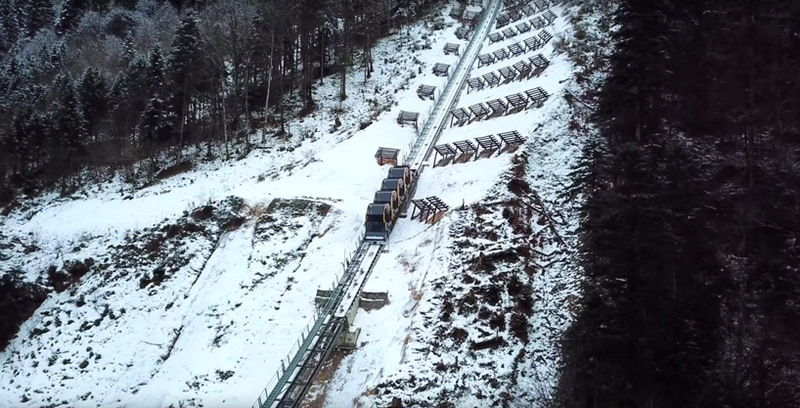 the world’s steepest funicular railway is now in service and is being hailed as a triumph in modern design engineering. 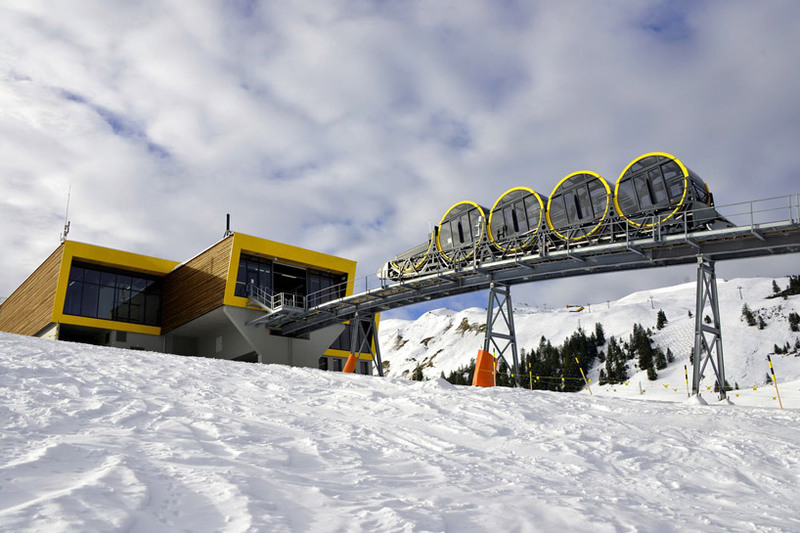 running from schywz to the mountain village of stoos, in switzerland, the €44.6m tram will travel 1,300 metres above sea level at an incline of 110 per cent. 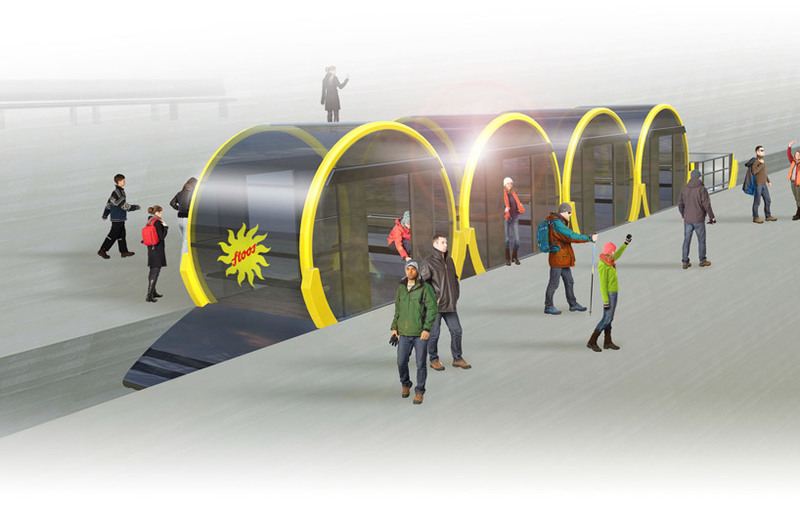 the stoos bahn tram which consists of two lines of cylindrical carriages features a level-adjusting function allowing each 34-passenger cabin to rotate as they incline. this means that for the 136 passengers on board, views of the mountainous surroundings will remain perfectly horizontal. the fenicular will reach a speed of up to 10 metres per second, climbing a total of 743 metres over a span of 1,738 metres. 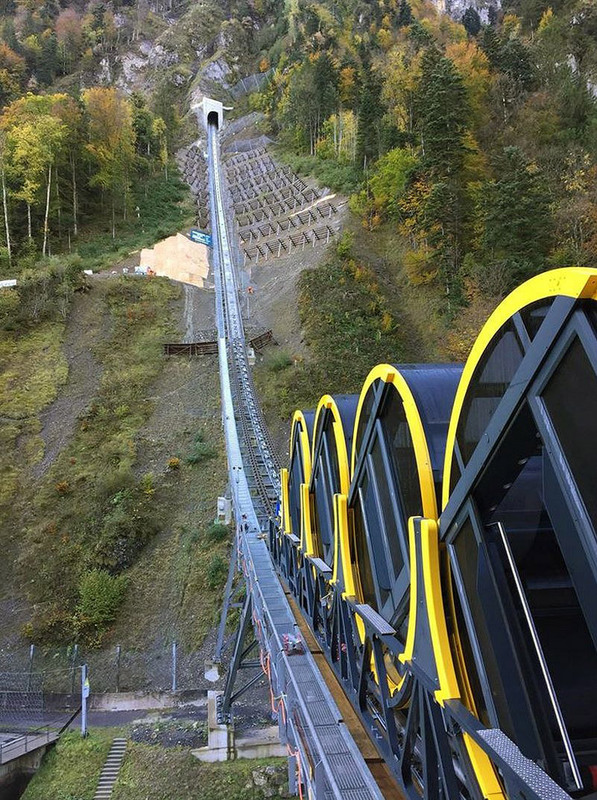 construction on the project began in july 2013 after designs were chosen to replace an older system that had been in place since 1933. a traditional aerial gondola funicular was ruled out because it would have had to pass through an active shooting range. 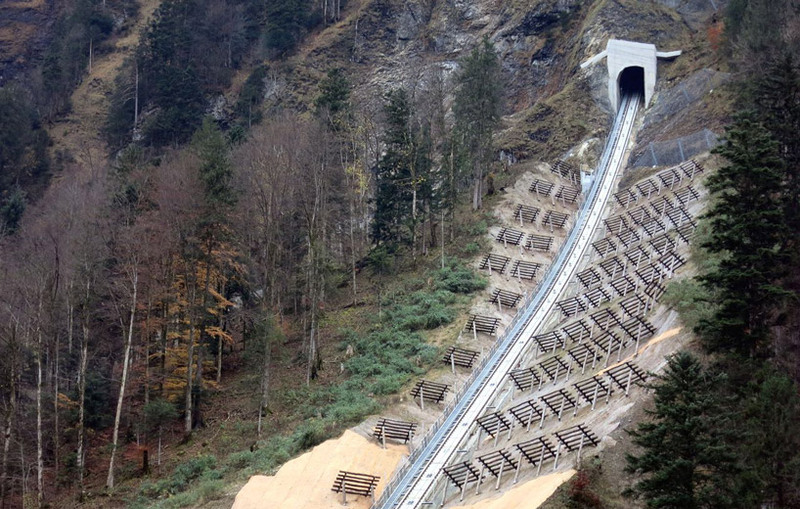 the previous world record for the steepest funicular train was formerly held by the gelmerbahn at bern, also in switzerland, boasting a gradient of 106 per cent. in england the nearest rival to the title is the east cliff lift in hastings, with a gradient of 78 per cent. 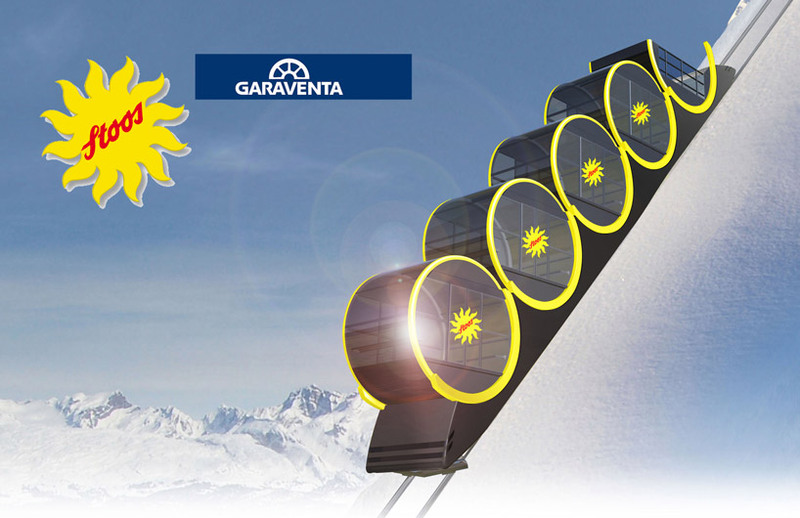 the stoos bahn tram which consists of two lines of cylindrical carriages features a level-adjusting function allowing each 34-passenger cabin to rotate as they incline. 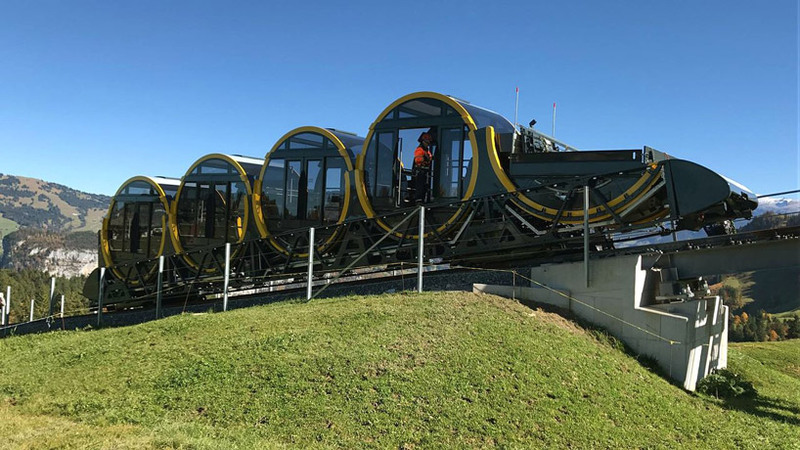 the previous world record for the steepest funicular train was formerly held by the gelmerbahn at bern, also in switzerland, boasting a gradient of 106 per cent.